please don't side-eye the blueberries. i promise, it works! 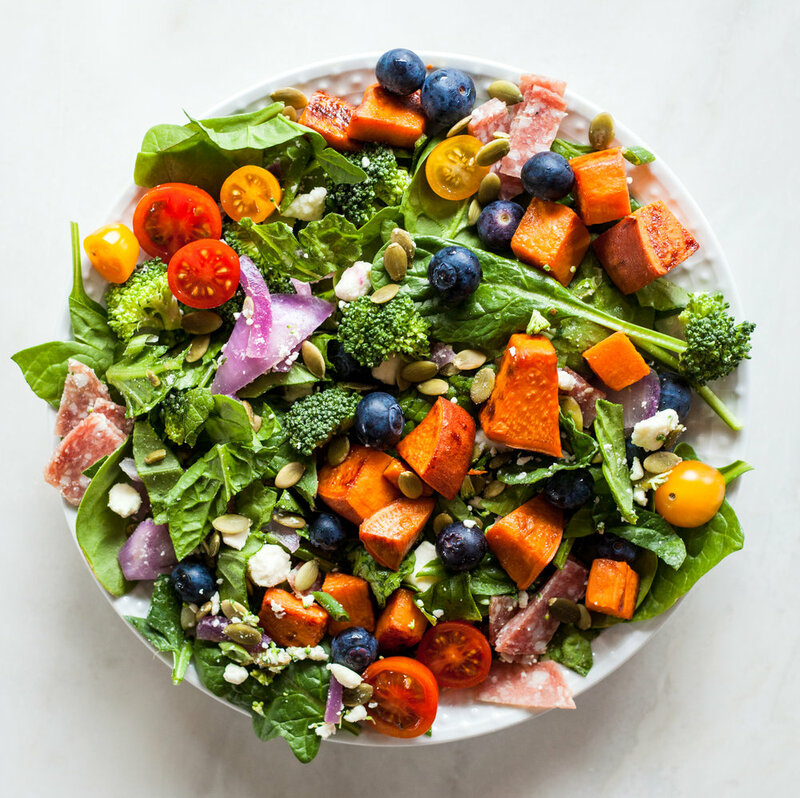 blueberries are pretty earthy tasting, so their juiciness fits right in within this salad, and completes the rainbow. 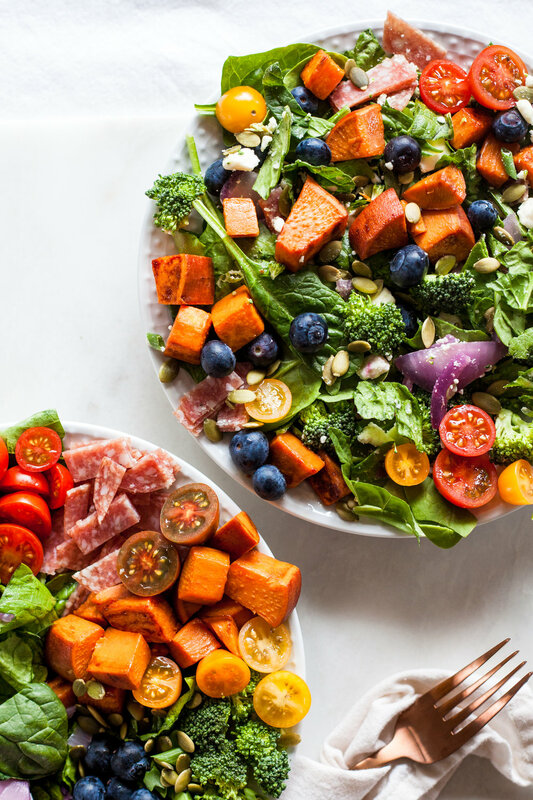 this salad is super hearty with the sweet potato and salami, very refreshing with all the crisp veggies, and ultra flavorful with the addition of the feta cheese and shallot vinaigrette. and the texture is also amazing! 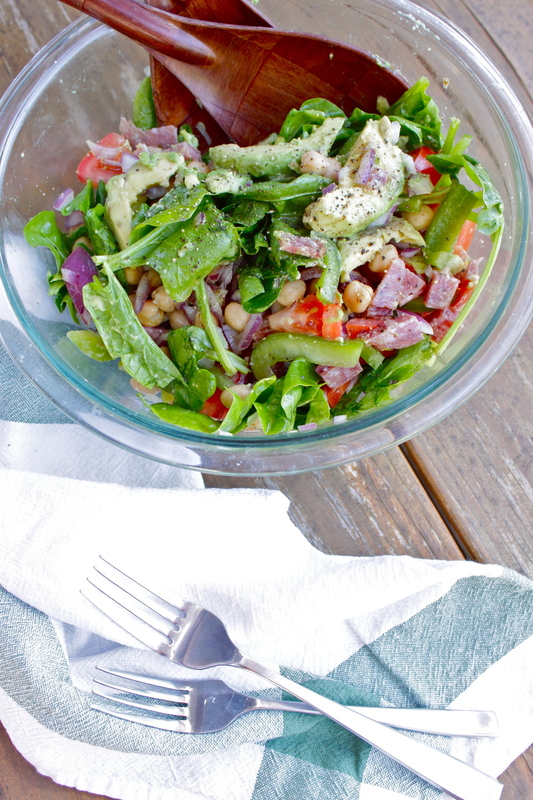 adding pepitas or sunflower seeds to salads is my jam. or yogurt bowls. or sandwiches, even! i've been having this veggie sandwich with sunflower seeds on it and it's quite goooood. i made a similar salad one night, and noticed it was almost a rainbow. i threw the blueberries in just for fun and was surprised how much i enjoyed it and that they really do jive with the other ingredients. pete went to serve some of this leftover salad later and he was like "what are these blueberries doing here?" lol. par-blanching the red onion slices in a strainer makes them a super gorgeous translucent fuscia purple color and also takes away that initial bite and lingering flavor that red onion has. woot. besides, this thing is perdy as heck. Heat 2 TB extra virgin olive oil in a large pan over medium heat. Wash the sweet potato and cut into bite-sized cubes. Toss the sweet potato in the olive oil and add about 1/4 cup of water to the pan. Cover immediately and raise heat to medium-high. Let the sweet potatoes steam about 5-10 minutes. Once the water has evaporated, remove the lid, sprinkle with a good pinch of salt and toss the potatoes to lightly brown. Remove from heat. Prepare the salad dressing while the sweet potatoes are cooking by combining all the dressing ingredients in a small jar and shaking vigorously. Store extras in the fridge. For the red onion, boil a kettle of water or a pot of about 5 cups water. Add the red onion slices to a strainer in the sink and pour the boiling hot water over. Rinse with cold water and drain. I like to do extra onions while I'm doing this step and store them in the fridge to have on hand for other salads, tacos, etc. Prepare all the remaining vegetables as instructed and toss in a large salad bowl, adding the sweet potatoes and tomatoes very last. Toss with a drizzle of the salad dressing to taste. my good friend whitney makes this amazing salad. i wanted to call this "the whitney," but that sounds more like a sandwich..? so "whitney's salad" it is. so many different textures and good flavors combined. nom nom nom. this salad is just so satisfying and scrumptious!!!! whitney is an awesome chick who i used to work with and then lived with for a few years and we went to nyc together last fall. she's da queen of making super quick dinners that always looked really yummy to me. and she'd often make a similar salad to this one. with perhaps a glass of red wine and some loud dixie chicks/classic hits on the side. hi whit! great salad making skills you've got! no avocado? but she likes those. i also think that avo texture rounds out this salad perfectly. the key whitney-style ingredients are: the banzo beans, salami, peperoncinis, and TJ's fat free balsamic dressing. she introduced me to that dressing and its quite amazing. she always puts the absolute perfect amount on salads, too...how you do dat whit? Chop and slice all veggies and ingredients as listed above and place in a large bowl. Add peperoncini juice and the balsamic dressing and toss to coat. Add salt and pepper to taste. Serve immediately. thanks for the awesome salad inspiration & friendship, whitdawg! love.